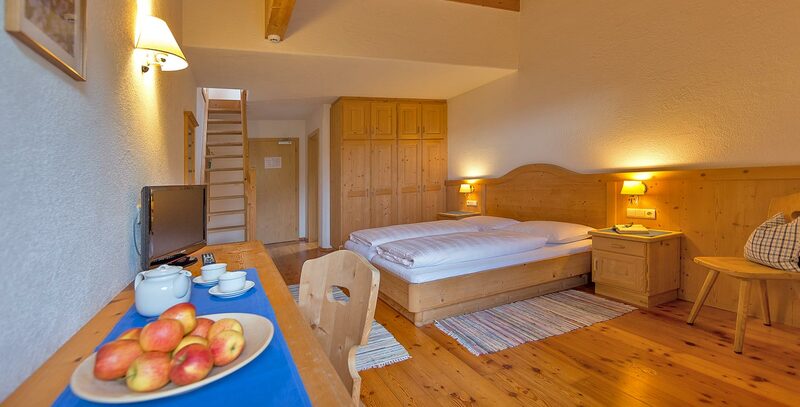 Stay in our cosy rooms in rustic South Tyrolean style. 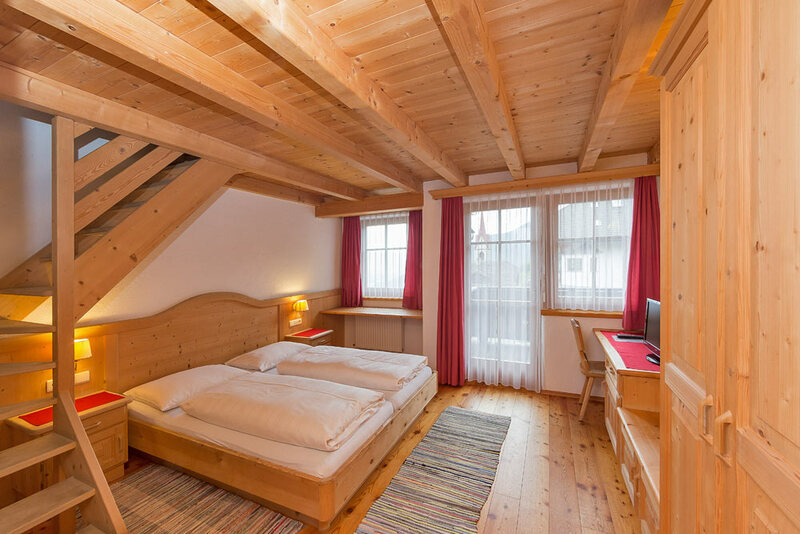 All rooms in Hotel Gasthof Huber in Mühlbach above Gais are spacious, comfortably furnished and flooded with sunlight. 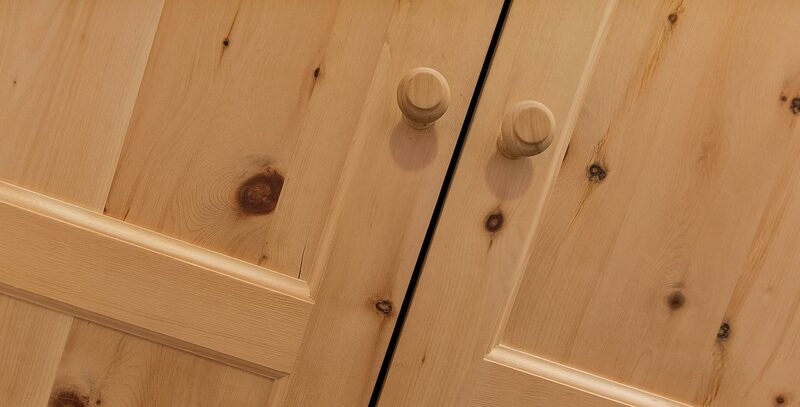 We’ve taken particular care to use natural materials: all rooms are furnished with timber from the region and natural wooden flooring. 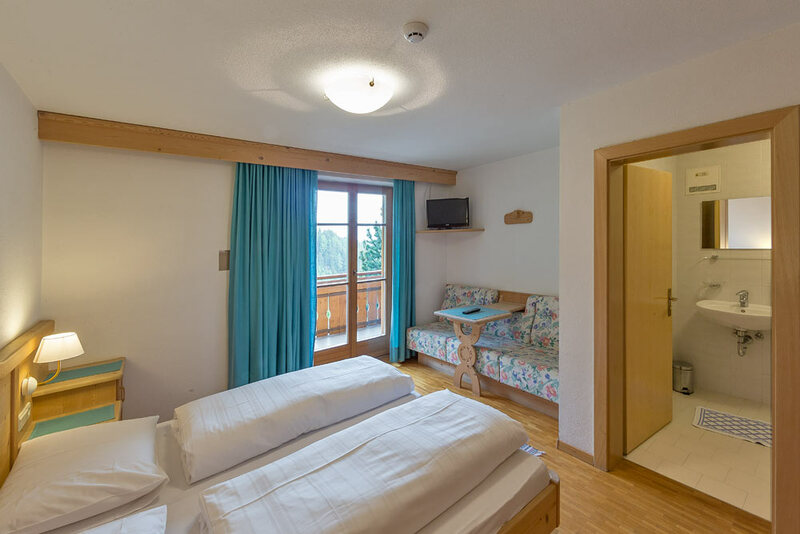 The positive characteristics of timber imbibe the rooms with a pleasant and soothing atmosphere – perfect for relaxing, and definitely conducive to good sleep! If you’re coming to us from the hustle and bustle of urban life, you’re in for an amazingly pleasant surprise. Here in the middle of nature, and far removed from noisy traffic, you can enjoy the luxury of sleeping with your window wide open, inhaling the fresh air and listening to the burbling of Mühlbach stream. 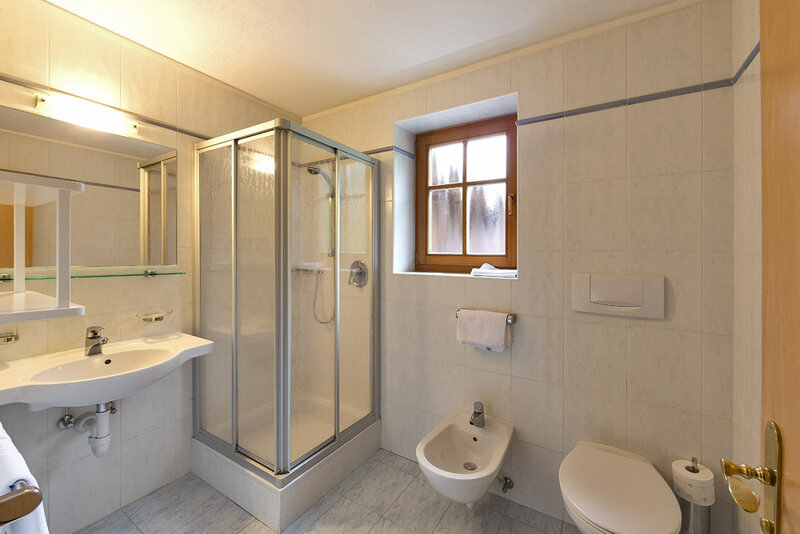 In Hotel Gasthof Huber, all rooms come complete with a shower, toilet, safe and SAT TV. Further, each room features either a spacious balcony or a sun deck. Enjoy fantastic panorama views as the sun rises over the Zinsnock and Geige summits, or breath-taking sunsets over Sambock mountain in the west. Our family rooms are perfect for family holidays with children. Thanks to their spacious and well-designed layouts, our family rooms are ideal for up to 5 persons. Each family room extends over two floors, with a bedroom for parents and a bathroom on the lower floor. An internal staircase leads to an upper gallery and children’s room. Our family room include a shower, toilet, safe, SAT TV and a spacious balcony. 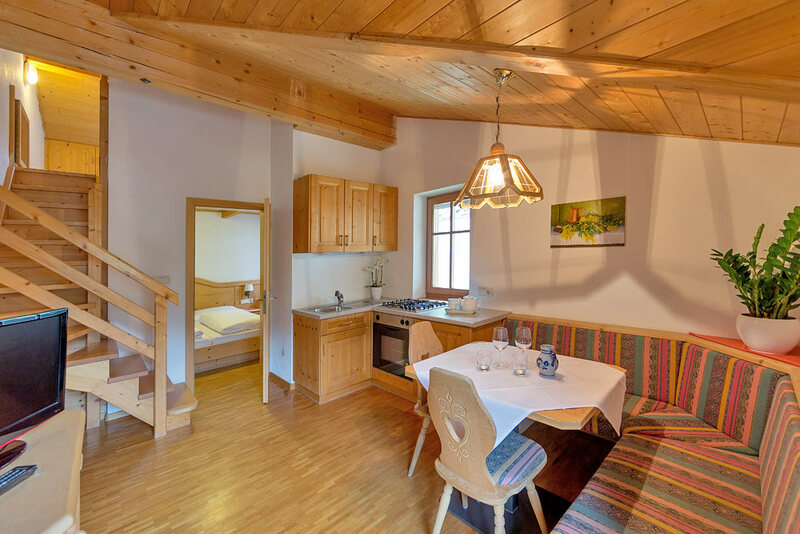 Besides our normal hotel rooms, Hotel Gasthof Huber also offers two lovely holiday apartments with plenty of room for all the family. Two separate sleeping areas and a bathroom provide all the comfort you need for your holiday in South Tyrol. The apartment centres around the kitchenette area, which includes an oven, sink and fridge. Each apartment also includes a shower, toilet, safe and SAT TV. From the spacious balcony, you can enjoy unspoiled views over to the Geige and its summit cross (2175m altitude). All prices quoted in Euro and apply per person and night in the respective room category. Included are admission to our SPA area; a minimum stay of 2 nights is required. Lodging, bed linen, heating, hot water, electricity, final cleaning, and all fees and taxes with the exception of visitor’s tax and final cleaning for pets are included. * Daily rate for a minimum stay of 2 nights. ¹ overnight with breakfast buffet, ² overnight with half board. Your room will be ready for you from 2pm on your day of arrival. On your day of departure, we request that you vacate your room by 10am. Please inform us briefly by telephone if you will be arriving after 7pm. We accept cash up to a total of €2999; higher amounts must be transferred or paid by cheque, credit card (VISA) or Bancomat. Your reservation is not valid until you have received written confirmation from us. Pets are permitted in Hotel Gasthof Huber by prior arrangement. Please note that pets are not permitted to enter the dining room, farmhouse parlours or spa area. For guests travelling with pets, we levy a € 20,00 surcharge for final cleaning. You may use the internet free of charge. Wi-Fi is available on the ground floor of the hotel. As of 1st January 2014, South Tyrol charges a tourist tax (local tourist tax, Regional Law no. 9 dated 16.05.2012). The revenue from this tax is used to expand and maintain infrastructures and services and to organise cultural and sports events. The tourist tax is charged at €1.35 per person (aged 14 years or above) per day. There is a free car park next to Hotel Gasthof Huber where guests can park. Please tell us in advance if any family members or friends will be arriving later. In Italy, all guests must be registered. 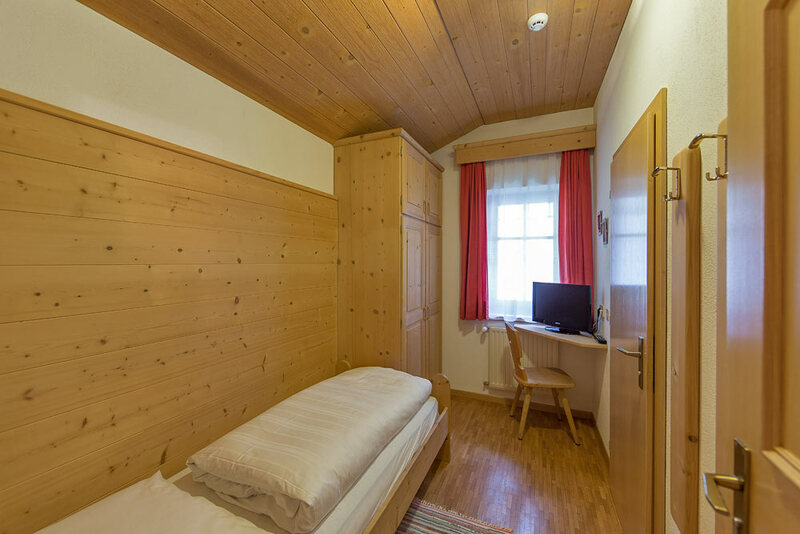 During the winter months, Hotel Gasthof Huber has its own ski storage room with heated ski shoe dryer. All prices are in euros, and are listed as the price per person per day when staying in the respective room category, including entry to our spa area, for guests staying at least 2 nights. Prices include overnight accommodation, bed linen, heating, hot water, electricity, room cleaning, all fees and taxes except for the local tourist tax and final cleaning for guests travelling with pets. If you arrive later than planned or depart earlier than planned, we will charge the full amount for the period originally booked. Place of jurisdiction is Bozen (Bolzano).